Party unification to be taken to its conclusion, Prachanda says - Integration Through Media ....! KATHMANDU: CPN (Maoist Centre) Chairman Pushpa Kamal Dahal ‘Prachanda’ has said that he was active to fulfill the responsibility of taking the party unification to its conclusion. 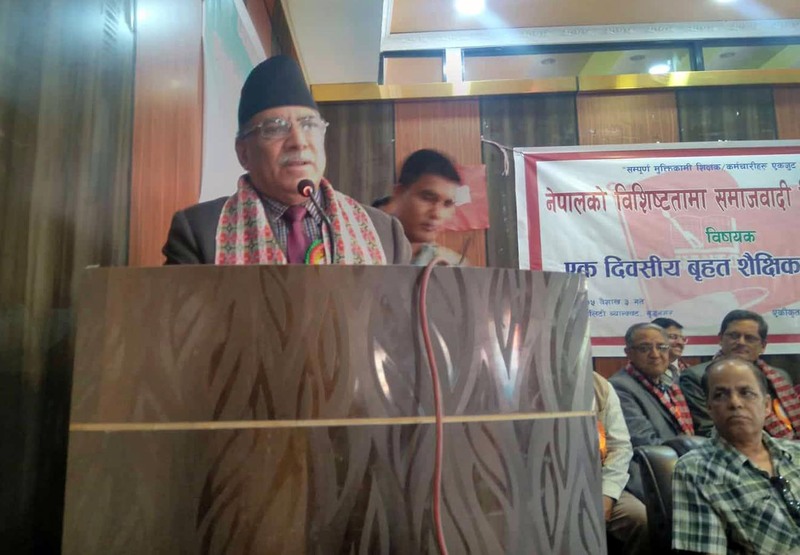 Inaugurating the educational workshop organised by All Nepal Teachers’ Organisation here Monday, Chairman Dahal said, “Party unification should to taken to its logical conclusion.” He further said that he would take decision by tomorrow after thoroughly going through the reports prepared on party unification. The CPN (MC) Chairman said the government should increase its budget on education to narrow down the attachment of guardians towards private schools. Saying that education system has been guided by bourgeoisie interests, he said that there was no alternative to socialist education as mentioned in the constitution. Likewise, Chairman Dahal underscored the need of implementing the educational system generating employment adding that 70 per cent education should be technical and 30 per cent should be non-technical education. The former Prime Minister, Dahal pointed out that the education brining change in the society was necessary as anomalies were rife in the society due to non-scientific education. Similarly, Minister for Education, Science and Technology Giriraj Mani Pokharel said that socialist educational policy should be formulated. He further said that preparations were on to give priority to sports, information technology, agriculture and Aayurveda education. Saying that educational condition of community schools was poor, Minister Pokharel said teacher cannot give justice to their profession by joining political organisations.